You know who your installer is: You may not be able to verify your big box contractor’s credentials, but you will be able to check the reputation of a local, established plumber. You will get professional and personalized advice about which unit best reflects your situation and your pocketbook: Water heater options are myriad, and local, licensed plumbing companies such as ours are familiar with all of them. We will assess your current and future hot-water requirements and the condition of the pipes and drains that connect to your water heater. We’ll explain your options and give you a solid estimate of the real cost of replacement. Your plumber will ensure that all installation materials are made to last and original: Not infrequently, big box units are purchased, opened and then returned. You may feel some well-founded uncertainty about the condition of repackaged materials. In addition, some manufacturers offset their price agreements with big box stores by including lower-grade trim and accessories with the heater—for example, plastic instead of brass trim or drain assemblies. Big box contractors may not pay attention to these deficiencies. 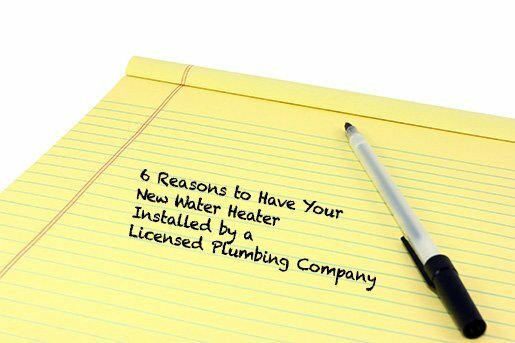 A licensed plumbing company, on the other hand, will ensure that your water heater components conform with the product description, and that all other installation accessories are durable and high-grade. You can be assured your local plumbing company is up-to-date with all local code requirements and safe installation practices: Local plumbers know when and how to pull a permit. We’ll ensure that your new unit is properly installed and vented, that all safety features are in place, and that the finished work conforms to approved clearance, drainage and regulatory parameters. Your plumber will guarantee the installation: Local plumbing companies, including ours, depend on a sterling reputation to stay in business. We stand behind our work, period. If you are dissatisfied with the installation, we make it right at no extra cost. Your plumber is your first call if you do have a warranty issue: It’s part of our service guarantee. There’s no need to get in line at the big box customer service desk. We are equipped to deal with the companies that supply us, and we can help you obtain parts or a replacement, if necessary. A local plumbing company such as Atlas Home Services eliminates the guesswork—and the hassle—around replacing your old water heater. We help you decide which unit you need, we use only high-quality materials, we let you know what the end cost will be, and we guarantee our work.